Every year around August 12/13th, the Perseid meteor shower peaks. It’s a fairly reliable shower that generates 60 or more meteors per hour. Unfortunately, this year the Moon is full at that time, washing out the sky and any fainter shooting stars. Still, it may be worth a shot for you. 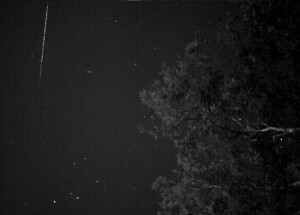 Meteor Showers Online has some info on the event, and I wrote a post a while back on how to watch meteor showers that still works. If you miss the Perseids, don’t fret: there are plenty of others this year. The Leonids and Geminids are also good performers. And any dark night will generally have a few to spot, just random pieces of fluff that hit us all the time. It adds up to about 100 tons of material a day burning up in our atmosphere, so why not go outside and see if you can spot any? <>em>Tip o’ the Whipple Shield to BABloggee Anu R for the link to the video.